The new design language allows for a screen-to-body ratio as high as 95 percent without sacrificing the original positioning of the webcam. The new series will carry Whiskey Lake Core i5-8265U or i7-8565U options with a starting price of $850 USD for the 13.3-inch model. 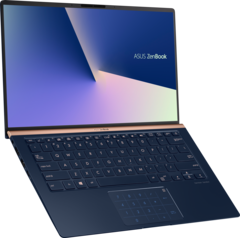 Unveiled at IFA 2018, the 13.3-inch Zenbook UX333, 14-inch UX433, and 15.6-inch UX533 are some of the smallest and lightest consumer laptops of their respective size classes. All three models share a new design that incorporates Asus' trademark "NanoEdge" narrow bezels on not just two or three sides of the display, but on all four. 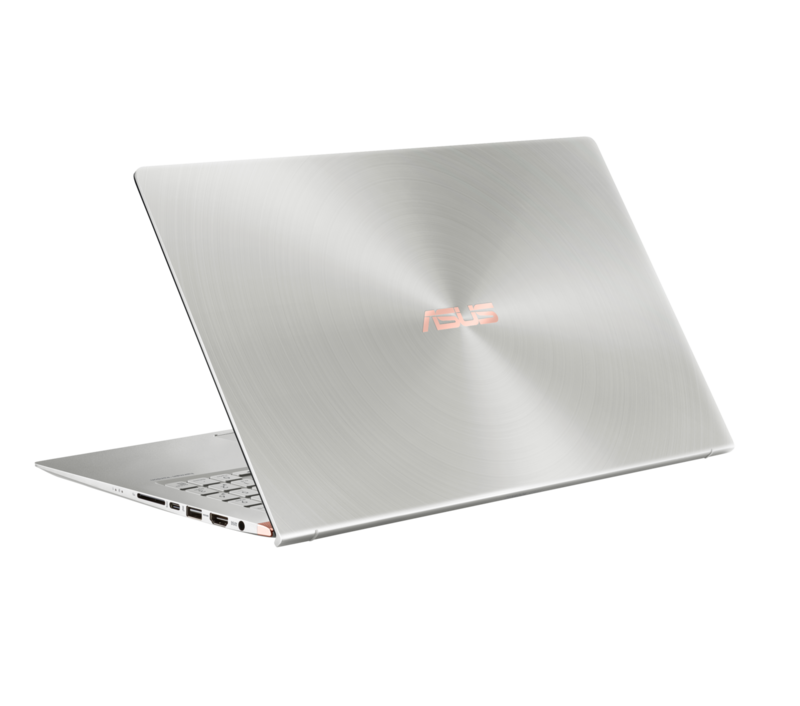 The result is a near-frameless lid with a 95 percent screen-to-body ratio not found on competing Ultrabooks like the XPS 13, XPS 15, or MateBook X Pro. In another blow to the aforementioned competitors, Asus has even managed to incorporate a Windows Hello-compatible HD IR webcam along the top edge despite the limited surface area. The specifications below reveal that each model will carry a FHD IPS panel, up to 16 GB of LPDDR3 or DDR4 RAM, and share nearly identical port options. The larger 15.6-inch UX533 benefits from GeForce MX150 and GTX 1050 Max-Q discrete graphics options as well as a dedicated NumPad and larger 73 Wh internal battery. A consequence of narrowing the bottom display bezel is that traditional hinges will not be compatible. In its place is an "ErgoLift" hinge that will lift the rear of the base at a slight angle when opened. The Zenbook UX333, UX433, and UX533 will all ship before the end of this month for a starting price of $850, $1000, and $1400 USD, respectively. Expect our usual reviews on each model in the coming weeks. 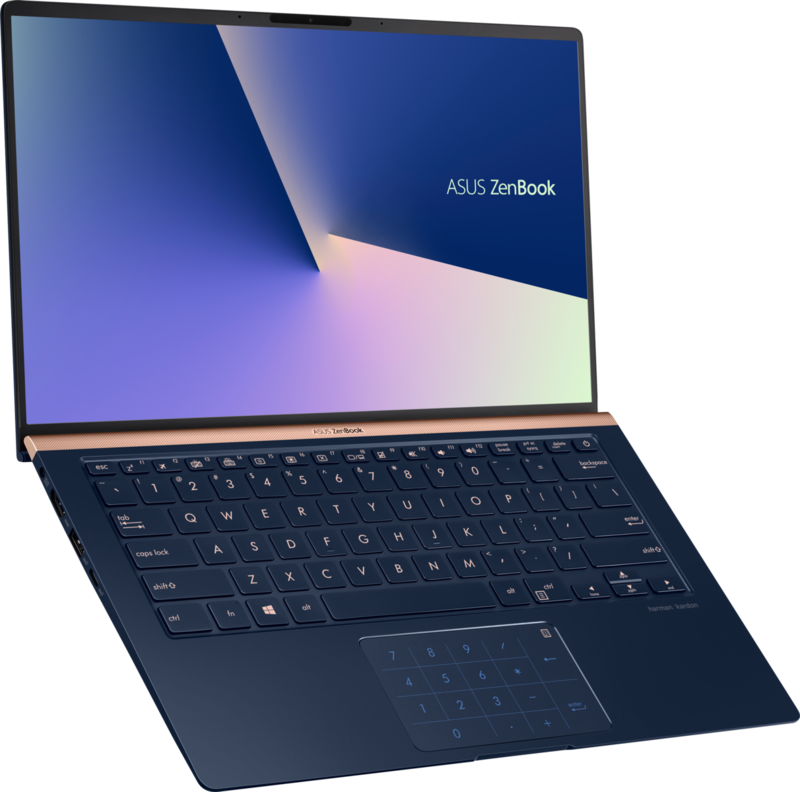 Fremont, California (November 6, 2018) — ASUS today is excited to announce the availability of an all-new ZenBook series, with the launch of the ZenBook 13 (UX333), ZenBook 14 (UX433) and ZenBook 15 (UX533). This fully redesigned series of premium thin and light laptops introduces the stunning new frameless NanoEdge display, which features ultraslim bezels on all four sides and an incredible up to 95% screen-to-body ratio for a near-borderless viewing experience. The NanoEdge display also allows for a much more compact design, giving each of the new ZenBook models the smallest footprint in its class. The 13-inch and14-inch models also include the exclusive new NumberPad, an innovative productivity enhancement that provides a full-size LED-illuminated numeric keypad built into the touchpad. All models feature a special 3D IR camera that allows fast face login using Windows Hello, even in low-light environments. The combination of performance and mobility is a defining feature of the ZenBook series, and the new models feature a full complement of high-performance components including options like the latest 8th Generation Intel® Core™ i7 quad-core CPU, NVIDIA® GeForce® GTX 1050 Max-Q graphics and 16GB RAM plus ultrafast PCIe® SSDs and gigabit-class Wi-Fi. The new ZenBook series ushers in a fresh era of ultracompact, ultralight laptops that boast the smallest footprints in their class1, a feat made possible by the new frameless NanoEdge design. The stunning frameless NanoEdge displays now feature ultraslim bezels on all four sides, creating an unrivaled up to 95% screen-to-body ratio that maximizes the screen area in the minimum physical space2. The result is simply breathtaking: the near-borderless visuals deliver a more immersive viewing experience with less visual distraction, making ZenBook the perfect choice for on-the-go creativity or entertainment. 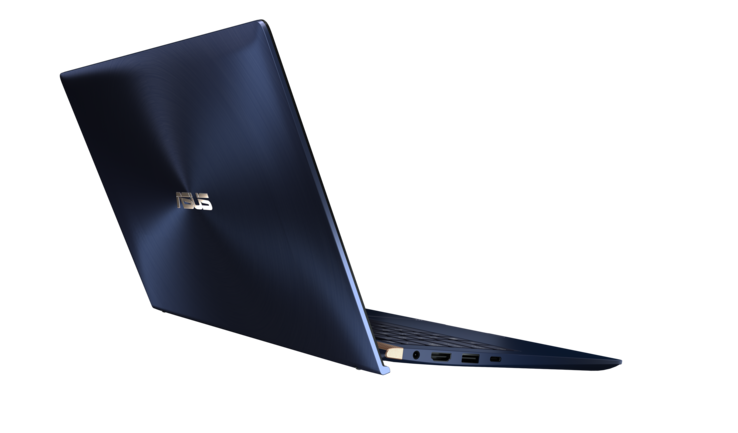 Complementing the groundbreaking new design, the traditional ZenBook style and elegance is apparent at a glance. All models feature the iconic Zen-inspired spun-metal finish on the lid and there's a choice of Royal Blue or Icicle Silver anodized finishes, both newly enhanced with a contrasting Rose Gold trim bar above the keyboard for an extra touch of luxury. For the ultimate on-the-go productivity, the ZenBook 13 and 14 are equipped with the exclusive new ASUS NumberPad. NumberPad solves the age-old problem of the lack of a dedicated numeric keypad on compact laptops. Tapping the NumberPad icon at the top right corner of the touchpad reveals a full-size LED-illuminated numeric keypad, allowing rapid and intuitive data entry or calculations. 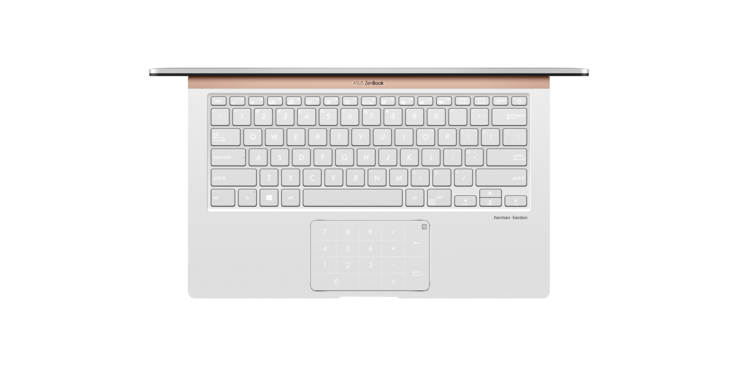 The ZenBook 15 features a traditional physical numeric keypad. All models feature an advanced 3D infrared (IR) camera, with see-in-the-dark capabilities to ensure fast, reliable hands-free face login with Windows Hello — even in dimly-lit environments. Unlike some designs with awkwardly placed cameras, the ZenBook’s camera is located on the slim top bezel of the NanoEdge display — yet another thoughtful design detail. When working on the go, it’s vital to be able to connect with anything and everything. 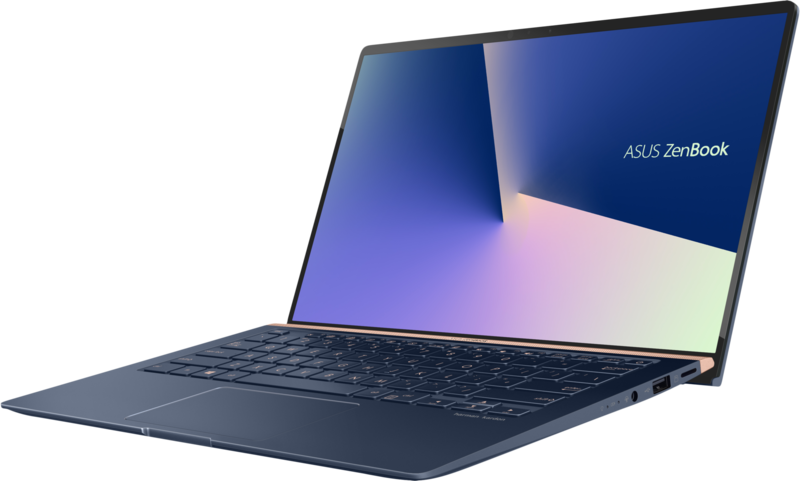 The new ZenBook series features a USB Type-C™ (USB-C™) port for any-way-up connections and superfast USB 3.1 Gen 2 (up to 10Gbps3) data transfers, and there's also a range of other USB ports, including USB Type-A (up to 5Gbps or 10Gbps) and/or USB 2.04. All models also include an HDMI port and a microSD or SD card reader, so it’s easy to connect to all your current and future peripherals. The new ZenBook series is built to deliver unbounded on-the-go performance, featuring up to the latest 8th Generation Intel® Core™ i7 processor and a range of fast graphics options, including up to NVIDIA® GeForce MX150 discrete graphics on ZenBook 13 and 14. The ZenBook 15 is equipped with a high-performance NVIDIA GeForce® GTX 1050 Max-Q GPU. All models are equipped with PCIe® SSDs and up to 16GB of RAM, making ZenBook ideal for creating complex documents, mining data, retouching photos, editing videos, or simply taking a gaming break. The new ZenBook series lets users do more, and do it quicker. Mobile professionals need to stay connected — at the fastest speed possible. All new ZenBook models feature gigabit-class Wi-Fi and Bluetooth® 5.0 lets users access all the benefits of the latest low-power peripherals and accessories. Designed for non-stop, on-the-go lifestyles, the new ZenBook series gives users the freedom to work all day on a single battery charge — up to an impressive 13 hours for ZenBook 13, 14 hours for the ZenBook 145, and an incredible 16 hours for ZenBook 156. The new ZenBook series meets the ultra-demanding MIL-STD-810G military standard for reliability and durability, undergoing a punishing test regime that includes extended tests for operation in harsh environments including extreme altitudes, temperatures and humidity. The ZenBook series has also passed ASUS internal laptop tests that exceed the standards set by the industry. ZenBook is the ultratough ultraportable, the perfect choice for discerning on-the-go professionals. ZenBook 14 (UX433) is now available at a starting MSRP of $999.99 USD from Amazon, Newegg and other leading resellers. 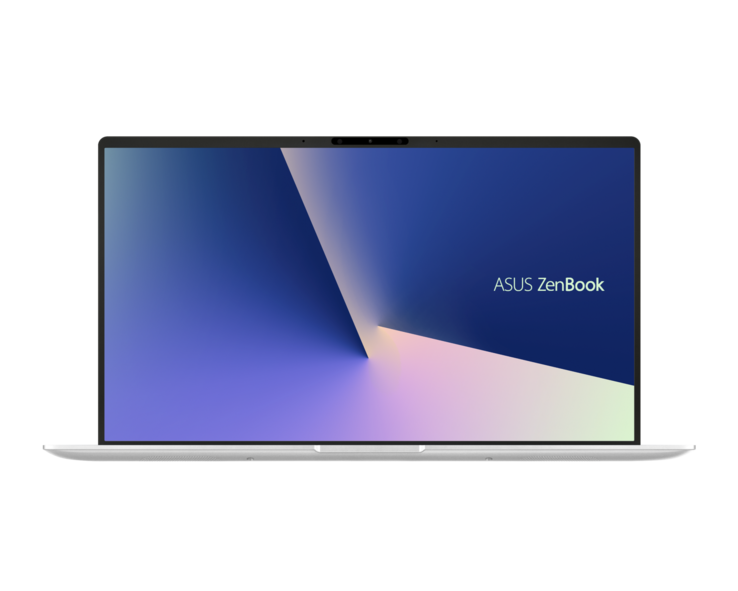 ZenBook 15 (UX533) is available starting this week from an MSRP of $1399.99 at Amazon, Newegg and other leading resellers. ASUS ZenBook 13 (UX333) will be available later in November with a starting MSRP of $849.99 USD.